This article is about the unit measure. For other uses, see Hertz (disambiguation). "Hz" and "Megahertz" redirect here. For other uses, see Hz (disambiguation) and Megahertz (disambiguation). Top to bottom: Lights flashing at frequencies f = 0.5 Hz (hertz), 1.0 Hz and 2.0 Hz, i.e. at 0.5, 1.0 and 2.0 flashes per second, respectively. The time between each flash – the period T – is given by 1⁄f (the reciprocal of f ), i.e. 2, 1 and 0.5 seconds, respectively. The hertz (symbol Hz) is the unit of frequency in the International System of Units (SI) and is defined as one cycle per second. It is named for Heinrich Rudolf Hertz, the first person to provide conclusive proof of the existence of electromagnetic waves. Hertz are commonly expressed in SI multiples kilohertz (103 Hz, symbol kHz), megahertz (106 Hz, MHz), gigahertz (109 Hz, GHz), and terahertz (1012 Hz, THz). The hertz is equivalent to cycles per second, i.e., "1/second" or . The International Committee for Weights and Measures defined the second as "the duration of 9 192 631 770 periods of the radiation corresponding to the transition between the two hyperfine levels of the ground state of the caesium 133 atom" and then adds the obvious conclusion: "It follows that the hyperfine splitting in the ground state of the caesium 133 atom is exactly 9 192 631 770 hertz, ν(hfs Cs) = 9 192 631 770 Hz." In English, "hertz" is also used as the plural form. As an SI unit, Hz can be prefixed; commonly used multiples are kHz (kilohertz, 103 Hz), MHz (megahertz, 106 Hz), GHz (gigahertz, 109 Hz) and THz (terahertz, 1012 Hz). One hertz simply means "one cycle per second" (typically that which is being counted is a complete cycle); 100 Hz means "one hundred cycles per second", and so on. The unit may be applied to any periodic event—for example, a clock might be said to tick at 1 Hz, or a human heart might be said to beat at 1.2 Hz. The rate of aperiodic or stochastic events occur is expressed in reciprocal second or inverse second (1/s or s−1) in general or, the specific case of radioactive decay, becquerels. Whereas 1 Hz is 1 cycle per second, 1 Bq is 1 aperiodic radionuclide event per second. This SI unit is named after Heinrich Hertz. As with every International System of Units (SI) unit named for a person, the first letter of its symbol is upper case (Hz). However, when an SI unit is spelled out in English, it should always begin with a lower case letter (hertz)—except in a situation where any word in that position would be capitalized, such as at the beginning of a sentence or in material using title case. Note that "degree Celsius" conforms to this rule because the "d" is lowercase.— Based on The International System of Units, section 5.2. The hertz is named after the German physicist Heinrich Hertz (1857–1894), who made important scientific contributions to the study of electromagnetism. The name was established by the International Electrotechnical Commission (IEC) in 1930. 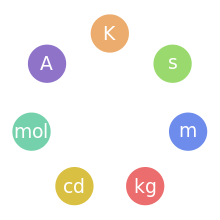 It was adopted by the General Conference on Weights and Measures (CGPM) (Conférence générale des poids et mesures) in 1960, replacing the previous name for the unit, cycles per second (cps), along with its related multiples, primarily kilocycles per second (kc/s) and megacycles per second (Mc/s), and occasionally kilomegacycles per second (kMc/s). The term cycles per second was largely replaced by hertz by the 1970s. One hobby magazine, Electronics Illustrated, declared their intention to stick with the traditional kc., Mc., etc. units. A heartbeat is an example of a non-sinusoidal periodic phenomenon that may be analyzed in terms of frequency. Two cycles are illustrated. Sound is a traveling longitudinal wave which is an oscillation of pressure. Humans perceive frequency of sound waves as pitch. Each musical note corresponds to a particular frequency which can be measured in hertz. An infant's ear is able to perceive frequencies ranging from 20 Hz to 20,000 Hz; the average adult human can hear sounds between 20 Hz and 16,000 Hz. The range of ultrasound, infrasound and other physical vibrations such as molecular and atomic vibrations extends from a few femtoHz into the terahertz range and beyond. For more details on why the frequency, including for gigahertz (GHz) etc., is a flawed speed indicator for computers, see Megahertz myth. In computers, most central processing units (CPU) are labeled in terms of their clock rate expressed in megahertz or gigahertz (106 or 109 hertz, respectively). This number refers to the frequency of the CPU's master clock signal ("clock rate"). This signal is a square wave, which is an electrical voltage that switches between low and high values at regular intervals. Hertz has become the primary unit of measurement accepted by the general populace to determine the performance of a CPU, but many experts have criticized this approach, which they claim is an easily manipulable benchmark as some processors use multiple clock periods to perform a single operation, while others can perform multiple operations in a single cycle. For home-based personal computers, CPU clock speeds have ranged from approximately 1 MHz in the late 1970s (Atari, Commodore, Apple computers) to up to 6 GHz in IBM POWER processors. Various computer buses, such as the front-side bus connecting the CPU and northbridge, also operate at various frequencies in the megahertz range. The "speed" or the more correct term bandwidth of networks, including wireless, such as Wi-Fi, 3G, 4G, LTE, etc. is not affected by the myth described above. In general, higher frequency means higher bandwidth or bit rates, that lower the times to download big files. In general, however, higher frequencies do not pass through walls, making lower frequencies an advantage e.g. indoors (most common equipment reports the highest frequency used, but usually also work at lower, making this often not a problem). Bandwidth is often equated with "speed", while latency ("lag"), is the perceived problem, that is a distinct measure from bandwidth, while higher bandwidth has an influence on latency. Higher frequencies than the International System of Units provides prefixes for are believed to occur naturally in the frequencies of the quantum-mechanical vibrations of high-energy, or, equivalently, massive particles, although these are not directly observable and must be inferred from their interactions with other phenomena. For practical reasons, these are typically not expressed in hertz, but in terms of the equivalent quantum energy, which is proportional to the frequency by the factor of Planck's constant. ↑ "hertz". (1992). American Heritage Dictionary of the English Language (3rd ed. ), Boston: Houghton Mifflin. ↑ "SI brochure: Table 3. Coherent derived units in the SI with special names and symbols". ↑ "[Resolutions of the] CIPM, 1964 – Atomic and molecular frequency standards" (PDF). SI brochure, Appendix 1. ↑ "(d) The hertz is used only for periodic phenomena, and the becquerel (Bq) is used only for stochastic processes in activity referred to a radionuclide." "BIPM – Table 3". BIPM. Retrieved 2012-10-24. ↑ "SI brochure, Section 2.2.2, paragraph 6". ↑ Cartwright, Rufus (March 1967). Beason, Robert G., ed. "Will Success Spoil Heinrich Hertz?" (PDF). Electronics Illustrated. Fawcett Publications, Inc. pp. 98–99. Retrieved 2016-03-29. ↑ "Black Hole Sound Waves - Science Mission Directorate". science.nasa.go. ↑ Asaravala, Amit (2004-03-30). "Good Riddance, Gigahertz". Wired.com. Retrieved 2012-04-28.